Good restaurant. Nice fences nearby. What more can I say? 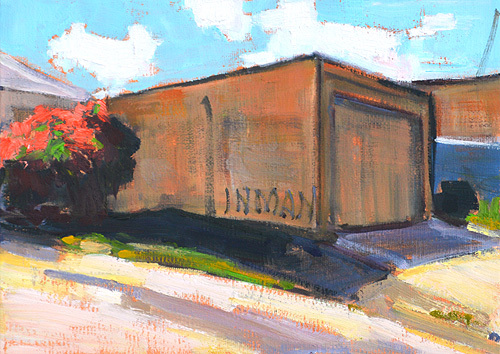 This entry was posted in Landscape Paintings, San Diego Paintings, Urban Landscapes and tagged 5 x 7 inches, bougainvillea, convoy, oil on linen on panel, san diego, urban on August 24, 2015 by Kevin. 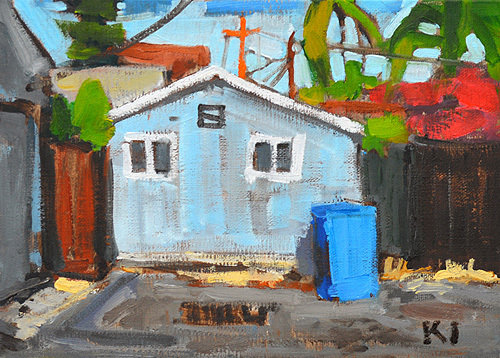 This entry was posted in Landscape Paintings, San Diego Paintings, Urban Landscapes and tagged 5 x 7 inches, alley, bougainvillea, california, city, garage, graffiti, oil on linen on panel, san diego, urban on May 11, 2014 by Kevin. 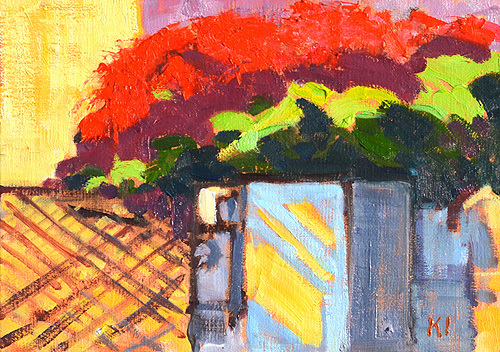 This entry was posted in Landscape Paintings, San Diego Paintings, Urban Landscapes and tagged 5 x 7 inches, bougainvillea, california, downtown, little italy, oil on linen on panel, san diego, utility box on May 6, 2014 by Kevin. 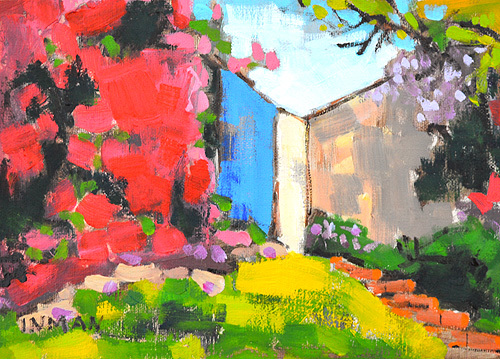 This entry was posted in Landscape Paintings, San Diego Paintings, Urban Landscapes and tagged 5 x 7 inches, bougainvillea, california, hillcrest, house, landscape, oil on linen on panel, painting, san diego on March 28, 2014 by Kevin. 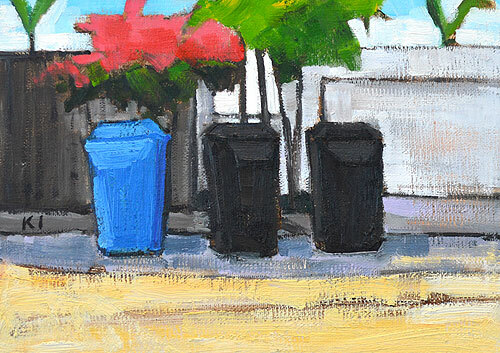 This entry was posted in Landscape Paintings, San Diego Paintings, Urban Landscapes and tagged 5 x 7 inches, bougainvillea, california, flower, landscape, oil on linen on panel, painting, recycling bin, san diego, trash can, urban on January 14, 2014 by Kevin. 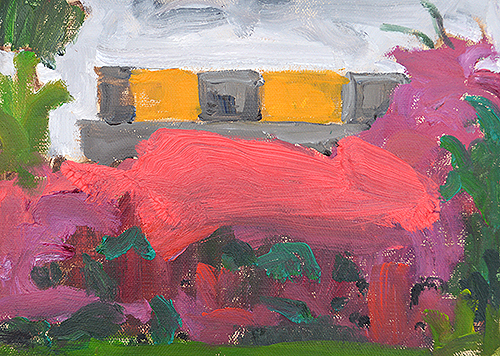 This entry was posted in Landscape Paintings, San Diego Paintings, Urban Landscapes and tagged 5 x 7 inches, bougainvillea, california, flowers, landscape, oil on linen on panel, pink, red, san diego on January 1, 2014 by Kevin. 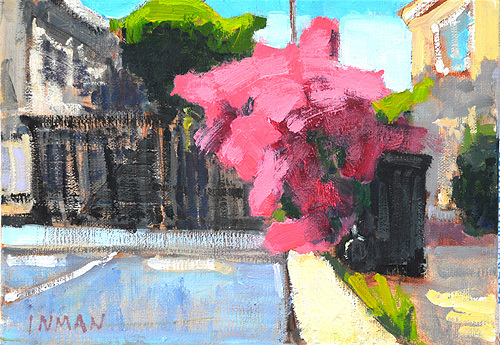 This entry was posted in Landscape Paintings, San Diego Paintings, Urban Landscapes and tagged 5 x 7 inches, bougainvillea, hillcrest, oil on linen on panel, pink, san diego, urban on December 25, 2013 by Kevin. 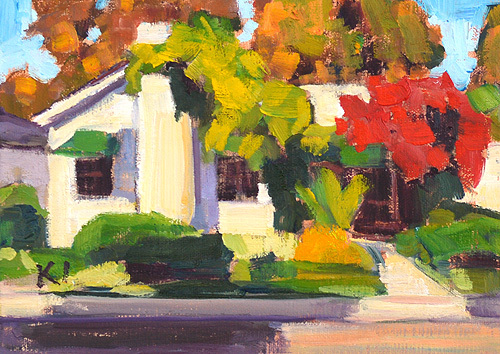 This entry was posted in Landscape Paintings, San Diego Paintings, Urban Landscapes and tagged 5 x 7 inches, bougainvillea, california, hillcrest, oil on linen on panel, san diego on December 22, 2013 by Kevin. 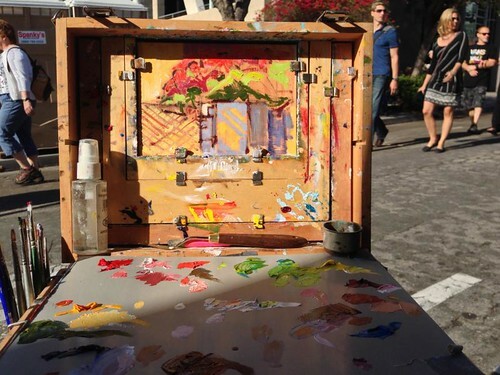 A small spot of beauty on a busy street. I painted this last year. 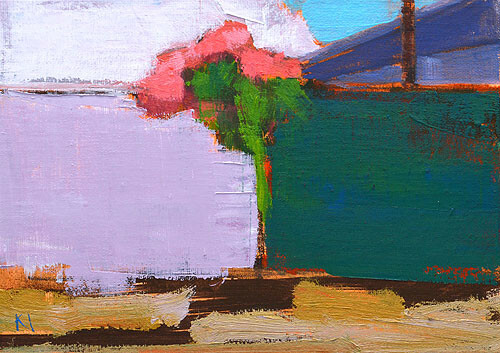 This entry was posted in Landscape Paintings, San Diego Paintings, Urban Landscapes and tagged 5 x 7 inches, bougainvillea, fence, flowers, garden, hillcrest, oil on linen on panel, san diego on December 17, 2013 by Kevin. 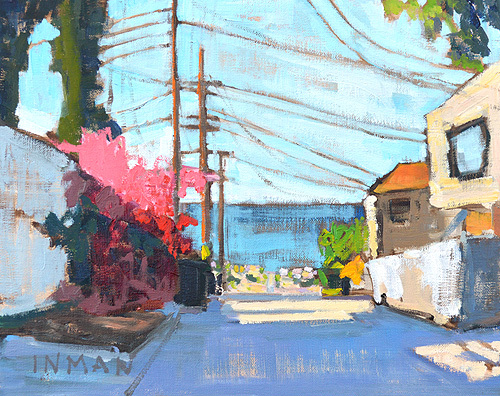 This entry was posted in Landscape Paintings, San Diego Paintings, Seascape Paintings, Urban Landscapes and tagged 8 x 10 inches, alley, bougainvillea, california, OB, ocean beach, oil on linen on panel, power lines, san diego, sea, seascape, telephone wires on December 12, 2013 by Kevin. 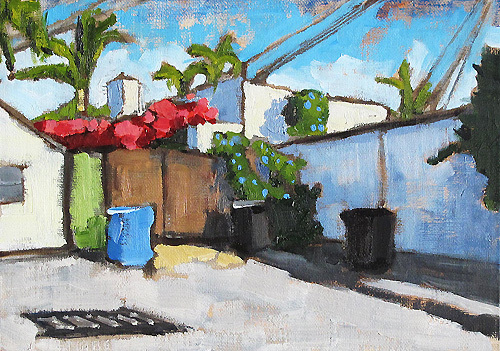 This entry was posted in Landscape Paintings, San Diego Paintings, Urban Landscapes and tagged 5 x 7 inches, alley, bougainvillea, city, hillcrest, landscape, oil on linen on panel, san diego, trash cans on October 20, 2013 by Kevin. On vacation in Santa Barbara, on foot. So we can stop at the bar if we want. You never know when you’ll discover someplace beautiful just walking up the road. 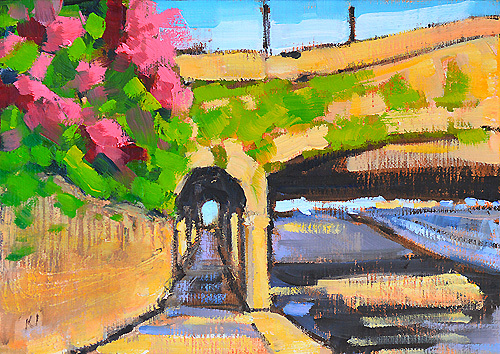 This entry was posted in Landscape Paintings, San Diego Paintings, Urban Landscapes and tagged 5 x 7 inches, architecture, bougainvillea, bridge, california, oil on linen on panel, pink flowers, santa barbara, tunnel on August 13, 2013 by Kevin. Bougainvillea in a North Park alley, in San Diego. 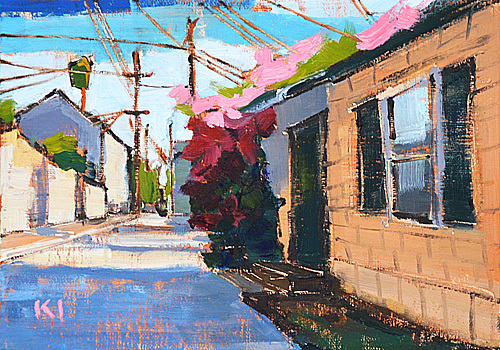 This entry was posted in Landscape Paintings, Urban Landscapes and tagged 5 x 7 inches, alley, bougainvillea, building, california, north park, oil on linen on panel, palm tree, san diego on July 17, 2013 by Kevin.